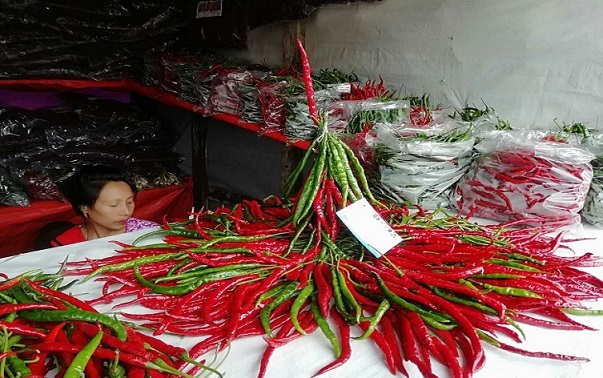 The three-day long 9th Chilli Festival was inaugurated at Sirarakhong village, Ukhrul district on Wednesday. The god’s gift – Hathei is the main theme of the festival this year. There are seven varieties of chillies in the state and if Hathei is added then the number increases to a total of eight varieties. On the other hand, chillies are grown at around 300 hectares and King Chillies are grown at around 100 hectares of land and production is more comparing to previous year. The official sources said special survey is needed to record regarding the production of chillies adding that the areas for the cultivation of the chillies need to be expanded as the demand is more than the actual supply. The festival was organised by Sirarakhong Hathei Promotion Committee & Sirarakhong Villagers under the sponsorship of North Eastern Council. Earlier Sirarakhong Sinao Long, the village women’s organisation organised the event. Speaking on the occasion, Horticulture and Soil Conservation Minister Shyamkumar said Manipur has many communities and places which have different specialties. He said the state government takes the festival seriously as it is aware of the many difficulties faced by the farmers, villagers and the specialty of the place. He promised that after discussing with the farmers and the villagers special steps will be taken up by the department to increase the production of the chillies. Shyamkumar also announced Rs 13.50 lakh for the construction of rural market shed and allocation of a 4×4 vehicle for the transportation of local produces to the capital city after September this year. He advised the people to focus and work harder for the production of more chillies. Joint Director Birachandra Singh, District Officer M Kirankumar Singh of Horticulture and Soil Conservation, Director H Balkrisna Singh of Directorate of Information and Public Relations attended the inaugural function of the festival. Chairman K Dickson of ADC Ukhrul, Headman V Wungkhan Zimik of Sirarakhong village, President Weapon Zimik of Tangkhul Naga Long, village headmen of different villages, villagers of Sirarakhong and others also attended the festival.